General Conference: A missed opportunity to spotlight Latter-day Saint women? 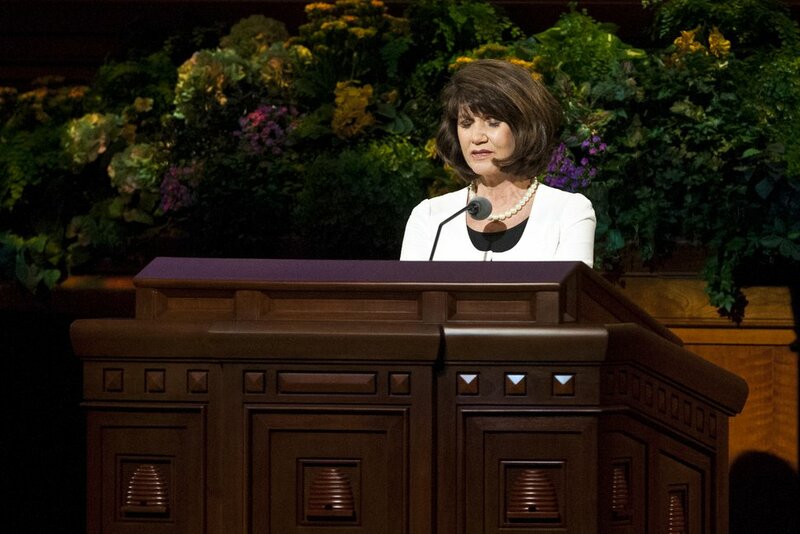 (Keith Johnson | Special to The Tribune) Bonnie H. Cordon, Young Women general president, speaks during the 188th Semiannual General Conference of The Church of Jesus Christ of Latter-day Saints on Oct. 7, 2018, in Salt Lake City. The just-completed General Conference promised a historic schedule shift that would highlight the emerging involvement and gender gains of Latter-day Saint women, yet, in the eyes of some, it wound up diminishing female visibility and voices. Here’s what happened: Instead of the all-male priesthood meeting, a women’s session was held. Alternating the priesthood and women’s sessions at the twice-yearly gatherings was billed as a way to enhance the prominence and prestige of female leaders — and, by extension, female members — in The Church of Jesus Christ of Latter-day Saints, where only men can be ordained. But the rhythms and routines of the conference apparently got in the way. 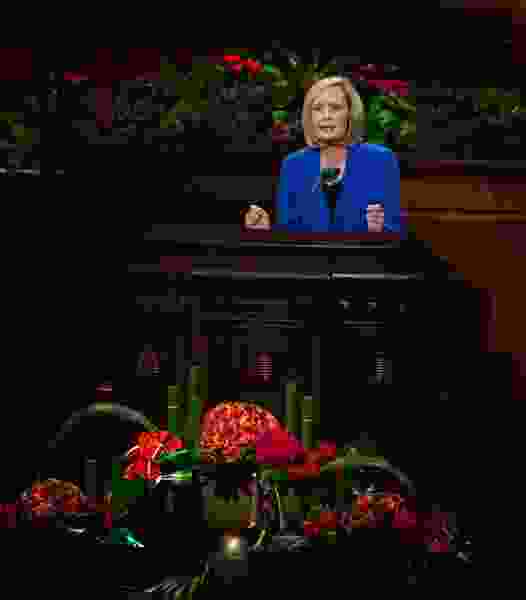 Normally, the women’s session included three female speakers and one leader from the faith’s presiding First Presidency. This time, though, the women’s remarks were followed by speeches by all three top men — a pattern set for priesthood meeting since at least the mid-20th century — and that trio took up more time. On top of that, only one woman gave an address during the general sessions — making a total of four women who spoke. That meant fewer women spoke than had become the norm in recent decades. Even so, some Latter-day Saint women were delighted that the whole First Presidency addressed the women’s session, treating that meeting as equivalent to the all-male priesthood session. After all, these members reason, the First Presidency and the Quorum of the Twelve Apostles deliver essential messages for the faithful. Other women, too, found the session troubling. Patrick Mason, head of Mormon studies at Claremont Graduate University in Southern California, echoes that sentiment. The meeting did provide one, well, near miss. In opening his sermon, Dallin H. Oaks, Nelson’s first counselor, referred to the “sister presidents” who spoke before him. That was encouraging to women, Jensen says, seeing in the term an improved status. 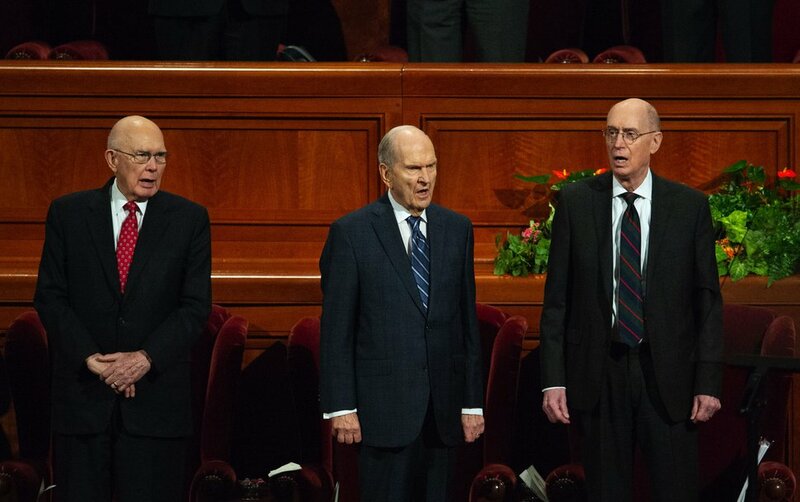 (Keith Johnson | Special to The Tribune) Left to right: President Dallin H. Oaks, President Russell M. Nelson and President Henry B. Eyring join The Tabernacle Choir at Temple Square, other church leaders and the congregation and sing a hymn during the 188th Semiannual General Conference of The Church of Jesus Christ of Latter-day Saints on Oct. 7, 2018, in Salt Lake City. Many women noted the difference in topics addressed by the women and men who spoke during that Saturday night session. The women discussed the nature of Jesus Christ, personal journeys of faith, rendering service to others, discipleship and ways of ministering, Boss says, while the three men focused on motherhood. Henry B. Eyring, Nelson’s second counselor, said the new “home-centered, church-supported” program of gospel instruction would increase female influence since women have the primary responsibility to “nourish” spirituality in the home. Earlier this year, he issued a similar challenge to Latter-day Saint youths but has not, so far, made the same suggestion to men. In this #MeToo moment, for instance, more and more women are speaking out and sharing their stories on the internet. Others chafe at Nelson’s call to women, she says, “stereotypically lumping them in with children,” who have different needs regarding social media. Women use such tools “powerfully,” Jensen says, for employment, for election cycles, for supporting one another. (Photo courtesy of The LDS Church) Belle S. Spafford with Relief Society General Board. The history of Latter-day Saint women preaching at large church gatherings has not followed a single pattern, Janiece Johnson writes on the Juvenile Instructor blog. In October 1929, church President Heber J. Grant unexpectedly asked three female presidents — Louise Robison, Ruth May Fox and May Anderson — out of the congregation to speak. During the Utah-based faith’s 188-year history, though, General Conference mostly has been a men’s show. Women started to show up on a regular basis in April 1988 when Dwan J. Young, president of the children’s Primary, spoke. 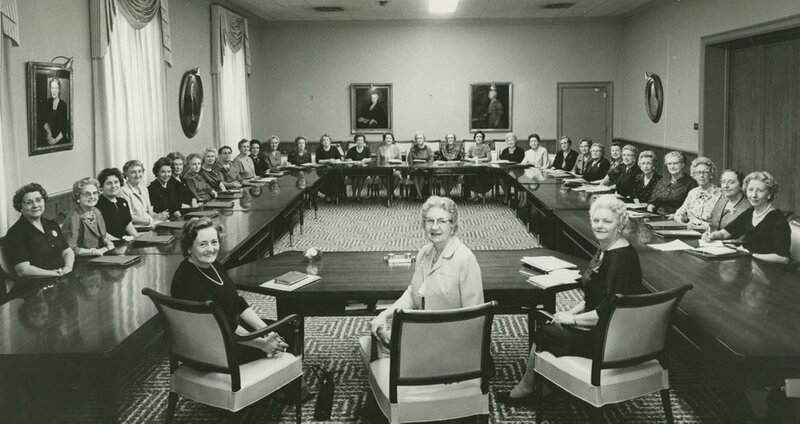 From then until October 1993, there was one female speaker per conference — plus, the three at the previous week’s women’s meeting, which didn’t officially become part of General Conference until a few years ago. This routine remained mostly constant until April 2017, which, like the recent session, had one female speaker (or four, counting the women’s session). In October that year, there were two in the general sessions, while April 2018 had three (but no separate women’s meeting). And, of course, women first offered General Conference prayers in 2013, mostly twice during general sessions, but this time around only once. Chris Detrick | The Salt Lake Tribune Jean A. Stevens prays during the morning session of the 183rd Annual General Conference of The Church of Jesus Christ of Latter-day Saints Saturday, April 6, 2013. Despite high expectations, the rotation this fall returned to one woman — Bonnie H. Cordon, Young Women general president — speaking to the whole body of believers. That is tough for everyone, Jensen says.